190 pages | 21 B/W Illus. Writing History 7-11 supports students and primary teachers helping them to explore ways in which activities involving the talk that underpins historical enquiry can be developed into reading and exciting, extended, reflective writing. The step that teachers and pupils take from ‘talk for learning’ to ‘talk for writing’ is a vital one. 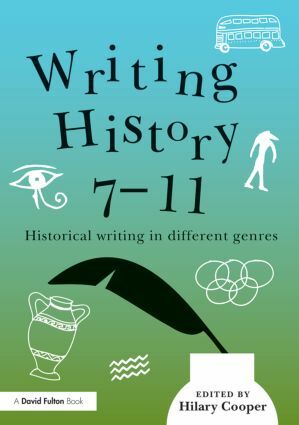 In this book the authors argue that all aspects of historical enquiry leading to writing involve discussion and dialogue which permeate every aspect of ‘doing history’. From this perspective they set out a theoretical framework for understanding the role of talk and reading in developing pupils’ critical thinking and confident reflective writing, then demonstrate through a series of case studies, in which teachers, university lecturers and pupils work together, how the theory is put into practice in the classroom. The expansion westwards of European settlers - writing a flap book exploring different perspectives. This indispensable book provides not only sources for pupils to use in their writing, but also models and exemplars of different styles and voices to draw upon. Hilary Cooper is Emeritus Professor of History and Pedagogy at the University of Cumbria and co-edits the The International Journal of Historical Learning, Teaching and Research. She has published widely and has an international reputation in her field. She is author of the bestselling History 5-11 now in its second edition.